Yesterday, Raghav expressed a desire to play Minecraft with friends. I was suggesting that he go online and play, as none of his friends here were into Minecraft. "But I have to have seen or know the person I play with. I cannot play with someone I don't know," he said quite emphatically. And so he wanted us (my husband and me) to play with him. I agreed to try if he taught me, and also asked if he would like me to ask my friend's son who he had met here and played Minecraft with a few months ago. He was immediately all excited. So I sat and wrote to her, sharing his request. "But why do you feel that you cannot play with someone you don't know? ", I prodded on. "Because I don't trust them. I cannot play with someone I don't trust....someone whose identity I don't know," he added. And we left it at that. Later at night, I was telling Raghav how I was going to be in another room, talking to my friend on skype. "Who is that? Is it ***? ", he asked. I smiled and said 'yes'. "But how do you talk to *** when you haven't even seen *** before? ", he asked quite surprised. "I don't know...but I like talking to *** and *** is my friend," I said. This morning, I broached the same topics again with him. "Yesterday, you were talking about trust....how you can't trust someone you haven't met or don't know....so what does trust mean to you? What does it make you feel inside? ", I asked. "Both people have to feel the same way about trust, for them to trust each other," he said. "Like I trust you and appa and Joel and Sadie and thatha and patti....and I feel that with the three of us, we feel the same way about trust.....do you think you and appa feel the same way about trust, the way I do? ", he asked. "....I think you do....but with my friends and thatha and patti, I am not sure they feel the same way about trust like I do.....so if I were to play Minecraft with you or appa, and you kill me, then the next time, I would still play the same thing with you again......but with anyone else, even if I trust them, if they kill me in Minecraft, I cannot and will not play that again with them....but I may play something else. So I trust them for some things, but not other things," he added. "Yes....I understand....so you feel that you can trust appa and me for everything and that we three feel the same way about trust....yes, and that is how I feel with this friend of mine too....I trust *** for everything. Trust is something that I just know and feel inside," I said. What a beautiful conversation that was....much like a piece of embroidery, being woven slowly with magic and wonder and a lot of heart. 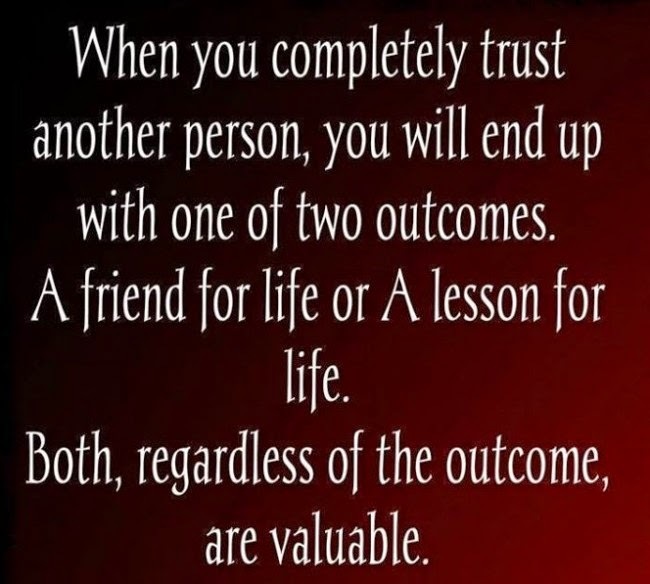 Yes, trust is the basis of any relationship....the foundation....on which everything else gets created. Trust is like a stick-it note - it just is or happens in the very first moment of the interaction...and once it is peeled off or removed, it will not stick on easily again.